We carved our Halloween pumpkin tonight! We went with a pirate pumpkin carving theme since my son is a big fan of Jake & The Never Land Pirates on Disney Junior. For a free Jake pumpkin carving template courtesy of Disney Junior, click here – this is the template that I used and I found it really easy to use and carve around. 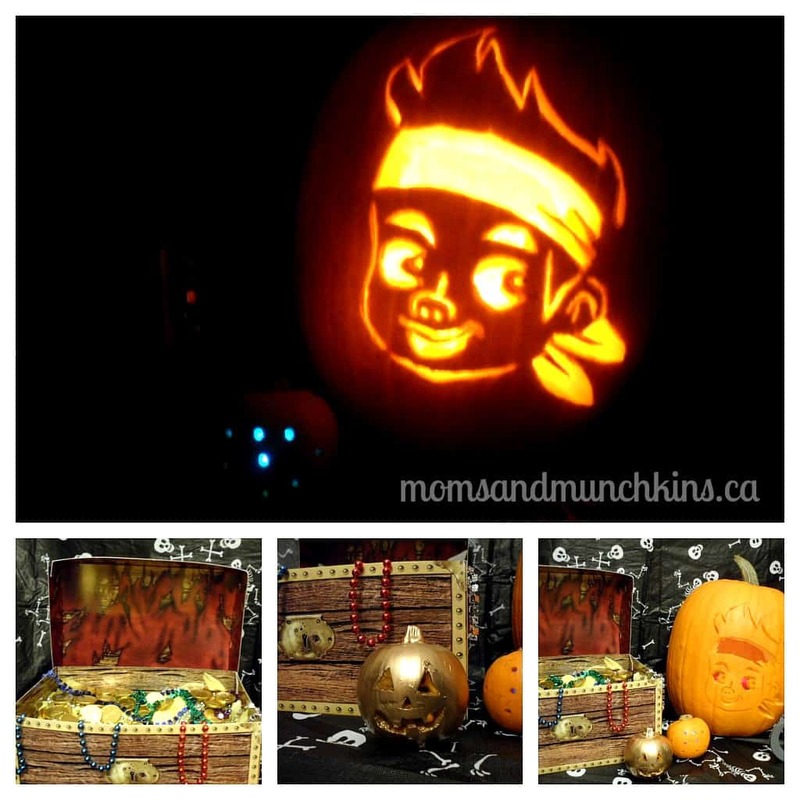 There are so many fun extras to add in to make this pirate pumpkin even more special! We wanted to have a team treasure chest filled with gold doubloons. We started with a cardboard treasure chest from our local party store. We filled this with yellow construction paper, bead necklaces and chocolate gold coins. We just wanted an episode featuring a golden pumpkin so we had to include that too! We took a mini pumpkin and spray painted it gold. I was trying to find a way to have pixie dust in our display as well so we took a small pumpkin and drilled small holes through it. We have to find a better candle for this one before Halloween night so that it can really glow. What will you be carving on your pumpkin this year? For more fun ideas for the holidays including party ideas, free printable games, activity ideas and more – visit our special Holiday Fun page. Scroll down to October and you’ll find LOADS of fun & free printable games for Halloween like scavenger hunts, charades games, word searches, haunted house ideas and more. To stay updated on the latest ideas for family fun, we’d love to have you join our community on Twitter, Facebook and Pinterest. THat pumpkin is awesome! Gonna have to share that template with a friend who has a pirate fan. LOVE it!!! I absolutely love carving fun pumpkins! Did you see my sock monkey o lantern?? Such a fun pumpkin! We have four kids, so we have a bat, a funny face, a pirate (as well) and two cats! We had a blast carving! I love your creativity! The theme looks so fun 🙂 That gold pumpkin is awesome! I love the creativity. That is awesome! I love it!1 It came out awesome! I love the golden pumpkin!! My boys would have loved to carve a Jake pumpkin!! Maybe next year, oh well. This year my 4 y/o decided he wanted his to be throwing up….Boys will be boys! Awesome job!! We carved our pumpkins last night and they are your traditional pumpkin faces, which is okay too. Happy Halloween! Adorable pumpkin! My pumpkin looks half-assed compared to yours in the creativity department. Oh, if I didn’t have a template to trace I would have lots of trouble coming up with a cute design.